This coming-of-age story follows the exploits of a WWII Navy seaplane pilot who became one of the first to fly night missions. From boxes of journals, photos, and artwork comes a true story filled with colorful descriptions of exotic locations, sea rescues, and the humor that was intrinsic to a Navy squadron’s daily life while at war in the South Pacific. Their seaplane odyssey stretched from the Solomon Islands to the northern tip of the Philippines and included a full range of missions, from search, attack, and bombing runs, to daring sea rescues. Howard’s journey through training and tours of duty is skillfully captured in his art and narratives. The descriptive verse from the artist’s viewpoint gives us a creatively told and intriguing portrayal of WWII’s Pacific Theater. 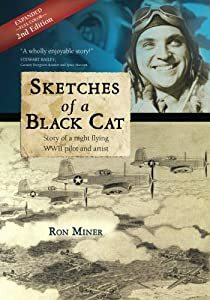 * * * * "Sketches of a Black Cat" is a unique and fascinating memoir of a World War II combat aviator ~ with original and previously unpublished sketches and photographs. This artfully crafted book is a must read for anyone in search of a new and completely different view into the world of war in the Pacific and on the home front during America's greatest conflict." ~ Larkin Spivey, military historian and author. Imagine sending your spouse to war with a heavy heart, then receiving a life-shattering phone call telling you he's been badly injured. Your beloved returns to your arms, but changed, broken, angry, conflicted, and in need of around-the-clock care. What do you do? 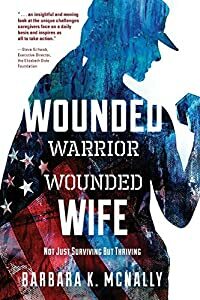 Wounded Warrior, Wounded Wife reveals the innermost thoughts of women who faced these challenges and prevailed--to not just survive, but thrive. We all know someone who was there, in World War II—probably a close relative, such as a father, brother, uncle, or grandparent. Most of us have hardly heard their stories about their young war years. We may have been afraid to ask about their stories, and they may assume we don’t want to know. But this was such an important life-changer, with certain death and torture on the line every day—waking up every morning for days and years without their families close by, constant battles going on, and amazing destruction. It was for us they fought, so we should know their stories. 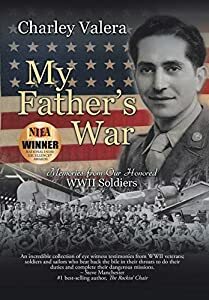 In this stirring collection of first-person narratives by WWII veterans, Charley Valera opens readers’ eyes to the story of how young, ordinary people from modest backgrounds became incredible soldiers, fighting a nasty, close battle that ranged from dropping bombs on barely visible targets to hand-to-hand combat—even fistfights. Perhaps some of the stories aren’t exactly how events transpired, but they do capture exactly how each person remembers them. Many of these veterans are now ninety to ninety-six years old. Charley Valera honors them by chronicling their amazing, heroic war efforts before they are gone and it’s too late. We should all salute these brave men and be sincerely grateful for the sacrifices they made for our country and for each one of us. LIBERTY LADY is the true story of a WWII bomber and its crew forced to land in neutral Sweden during the Eighth Air Force’s first large-scale daylight bombing raid on Berlin. 1st Lt. Herman Allen was interned and began working for his country’s espionage agency, the OSS, with instructions to befriend a businessman suspected of selling secrets to the Germans. 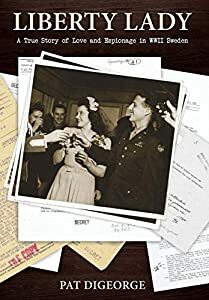 Soon Herman fell in love with a beautiful Swedish-American secretary working for the OSS, their courtship unfolding amid the glamour and intrigue of wartime Stockholm. As Swedish newspapers trumpeted one of the biggest spy scandals of the war, two of the main protagonists walked down the aisle in a storybook wedding presided over by the nephew of the King of Sweden. After having written my first Award Winning book, Missions Of Fire And Mercy, I felt something was missing. I have always had a great deal of respect for the Infantry (grunts) who our unit, C/227th Assault Helicopter Battalion, 1st Air Cavalry supported. They were always appreciative of the helicopters and crews. My personal feeling is that they heroically fought the worst part of the Viet Nam war. Chopper Warriors will introduce many of the survivors of that war. The true, interesting, guy-wrenching and often thrilling stories you are about to read are from men whom I am honored to know. Many of the words written here are theirs from interviews I have done. As a storyteller, I have tried to recapture the events as they happened forty-five plus years ago. The narrative and scenes created here are mostly true, and the dialogue is written for all audiences from teenagers to adults, men and women alike. Our unit supported these men in every way; inserting them into the fiery hell of battle, and supplying them with ammo, food, water, and mail, often under intense enemy fire. When they were ready to move on to a different LZ, we picked them up and re-inserted them. When they were sick or wounded, we flew them to the closest field hospital. When they were silently lying in the jungle, having breathed their last, they were solemnly picked up and loaded on our choppers. We reverently evacuated them to an area where they could be cared for, prior to their final flight back to their loved ones. I have the utmost respect for the guys we called “grunts”. Though our military technology didn’t always work, the helicopter was a very useful tool for putting our troops right where they needed to be – deep within the enemy’s lair. More importantly, the choppers saved innumerable lives that in other wars would have been snuffed out. For that I am grateful to have been a part of the First Team in Viet Nam. In my personal stories that you will read, I have used actual names whenever possible. In other cases, names have been changed in honor of the families. It is my most sincere hope that these accounts will be read by many who have lost loved ones in this most unpopular war. Many soldiers involved in Viet Nam, the Gulf War, Iraq, Afghanistan, and others have declined to tell their own stories to those they love back home, as they actually happened. The feelings that war veterans have run very deep and are often very traumatic. Many don’t want to relive those horrendous nightmares. Severe cases of PTSD, guilt, or not wanting families to know what they went through are prevalent and very real. In many cases, their stories are relived here as they actually happened. Here, you may finally read about what your son, grandson, husband, father, or friend endured. Though honorable and often heroic, you can be sure the memories are horrible, and something they will never forget. Throughout these stories, you will see the word “grunts.” It seems that all wars have their own nomenclature. In Viet Nam, a grunt fought the toughest part of the war, in my mind. In many cases, that was to lessen the fear of their family and friends. Though noble, I personally feel that to be a shame. I pray that knowing what your loved ones went through may bring healing to a lot of you. 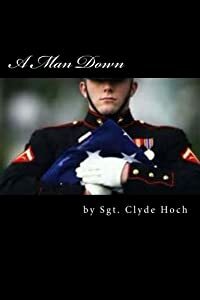 This is the story of four young men who sacrificed their lives for you the people of the U. S. They died at a very early age serving their country. They are true heroes. I am honored to write their stories. Two lost their lives in Vietnam. One lost his life in Afghanistan and one according to NCIS was a suicide. Was it a suicide? You decide! Read how a family coped with their loss. There were more suicides in the military in 2012 than combat deaths. Read what one veteran is doing to help veterans. Read the authors view on death. 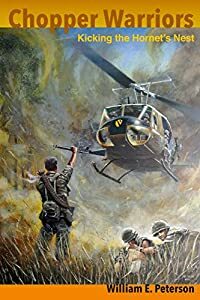 Little about Conrad Taylor's upbringing in a remote mining town in Guyana, South America, prepared him for West Point - at the height of the Vietnam War. An extraordinary opportunity for most, the highly-regimented United States Military Academy was a life-changer for him. Enduring culture shock and surviving rude awakenings hardened the rigorous West Point Experience. And, Third World politics after West Point - because of West Point - tested it severely. The truth-is-stranger-than-fiction memoir has a simple proposition. Fly-or-die! Award-winning "PATH to FREEDOM: My Story of Perseverance" describes what happened upon Taylor's return to a government turned repressive, anti-American, and paranoid - overnight. The Soviet-leaning, Cold-War-era dictatorship feared regime change. Its power-hungry leaders obsessed about him being a spy for the United States. His was the impossible task of proving that he was not - or else! The historically-accurate book provides a unique prism through which to see the cultural trauma of emigration, the unique experience that is West Point, the personal side of Cold-War-era geopolitics, and the mayhem of Third World politics. The view will be nostalgic for some, shocking to many, and enlightening for others. Its subtly-threaded love story will enchant - at the very least. The Smithsonian Institute displays PATH to FREEDOM: My Story of Perseverance in its Anacostia Museum Library. The world's premier archive selected the non-fiction as a source of insights about the history and culture of black people in the Western Hemisphere. 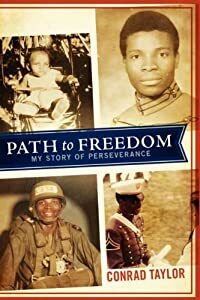 If you love nonfiction, which reads like a novel, "PATH to FREEDOM: My Story of Perseverance" is for you. Terry's father, Norris Wadsworth, was sent to help start a pineapple plantation and cannery on a new frontier in the Philippines. While the rich, dark soil produced golden fruit, the Wadsworths and other families built their homes on a remote plateau at the edge of the jungle. The compound was eventually called, Del Monte, a namesake to their company. The tropical oasis with a 9 hole golf course and even a grass airstrip became a popular destination for many government and military dignitaries. As a young child, Terry's days were full of happiness and adventure. Life, like the growing pineapple, was sweet. She had a little pony, attended a small school, and enjoyed playing with the other young Del Monte children. The only threats to her edenic life were occasional cobra and python snakes found around, and sometimes even in, their home. That is, until a much fiercer enemy struck 5000 miles away at Pearl Harbor. Within hours of the surprise attack in Hawaii, the Japanese military launched a similar assault on the Philippine islands and began their campaign to overtake the American Protectorate. Just before the war started the Del Monte management had helped the U.S. Army Air Corps build an airbase with two long, grassy runways nearby. Soon, the peaceful skies above their paradisiacal home were swarming with military war machines. Terry and her family found themselves on the dangerous battle front. General Douglas MacArthur, Philippine President Manuel Quezon and their families, plus many other important people hid from the Japanese in Terry's remote home as they waited to secretly fly from Del Monte to Australia. As the fighting intensified, Terry's family abandoned Del Monte to hide in the dense, mountain jungle and wait for an opportunity to also escape to Australia. While the families were in hiding, Del Monte itself became a target of the Japanese military. Bombs and shells rained down, on the homes, cannery, and airfield. Eventually the Japanese pushed the American forces into retreat. Terry and her family found themselves with only one option. Surrender! As they surrendered to the Japanese, Terry's father counseled her, "Live each day to the best of your ability. Do not get caught up looking so far ahead that, worrying about the future, you get discouraged and lose hope." The advice served her well, as the next three years of her interment as a prisoner of war were full of hardship and suffering. Though stripped of her possessions and freedom, Terry was grateful to be alive and to be with her parents. Together, the family hovered on the brink of starvation, battling deadly infections and disease, and eluding death at the hands of their captors. Yet, despite these conditions, they found purpose in living a meaningful life. Each prisoner had a job to perform and holidays were still observed, even if it meant singing Christmas carols in the hold of a rat infested cargo ship or feasting on wormy prunes for Thanksgiving. 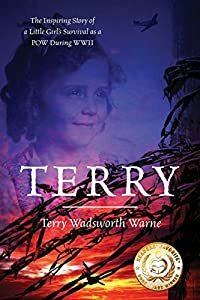 Terry's unconquerable spirit, as an eight to eleven year old prisoner of war, is a reminder that even in the most deplorable circumstances, life is what you make of it. Meanwhile, General McArthur and the United States military returned to take back the Philippines from Japan. Military leaders learned of a Japanese plan to execute all prisoners of war before they could be freed. A special American military unit was charged with the dangerous assignment to pass behind enemy lines, 70 miles deep into Japanese territory, and liberate the prisoners. Terry's life and the lives of thousands of other men, women, and children depended on the success of this miraculous rescue mission! 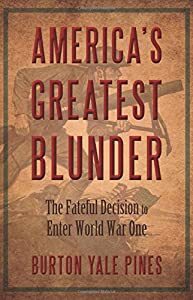 The tale of how America stumbled into war is told by America's Greatest Blunder. It chronicles America's journey from sensible neutrality to its war declaration. It then describes how legions of doughboys were mobilized and trained and how they won the war, giving victory to Britain and France - thus launching the young 20th century on its course of decades of unprecedented violence. 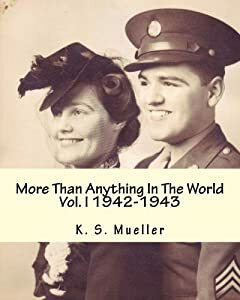 A collection of WWII love letters written by my parents during World War II from 1943 through 1945 when my father was a sergeant in the U.S. Army stationed in various locations including Illinois, California, Kansas, Louisiana, Texas, England, Germany, Belgium and France. Includes autobiographical documents written by Frank J. Mueller. Volume I comprises 1942 & 1943. Future volumes will complete the series.